My favorite would have to be the Sabertooth. They are fast, elusive, and great farmers. While not as damaging as say, a spino or a rex, they can still hold their own against most if not all animals. I really love my Argentavis, But I love Trilobites even more because now I no longer have to worry about deep sea diving for Oil or Pearls. My favorite hands down is the Spino. Its powerful on land, can swim indefinitely in the water (and at a decent speed). Not to mention it just looks like an awesome dino in general. I love the dire bear. It carries so much weight, and the sprint is amazing. If I only need to travel on flat land I will sometimes take a bear and far berries/meat along the way. 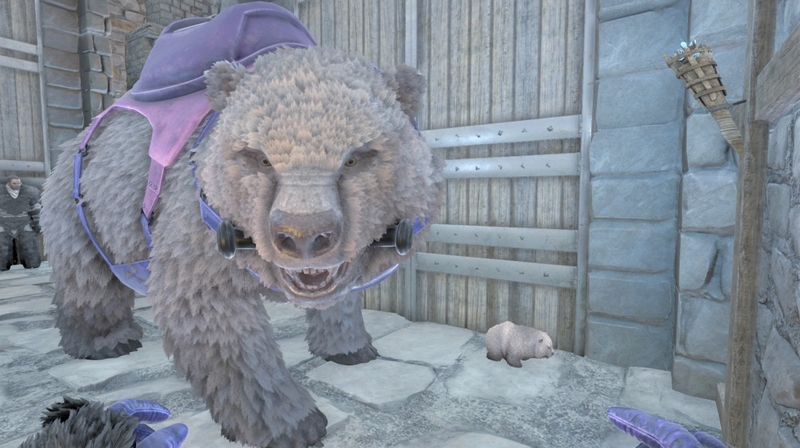 They knock down trees in one hit and make a great mount for taming as they have so much health and can run away if you need too. I'm a big fan of the dire bear, but add the quetzal and you can air drop dire bears! You don't even have to air drop them. Platform saddle means you can have an aircraft carrier Quetzel. I do wish they had more camera controls for platform saddles though. I thing a bear can swipe while being carried too. I love the argentavis ♥ !